Over on his blog DK8OK has created a post that explains how European SDR users can use their devices to monitor reflections coming off the Graves space radar. Graves is a space surveillance radar based in France which is designed to track spacecraft and orbital debris. 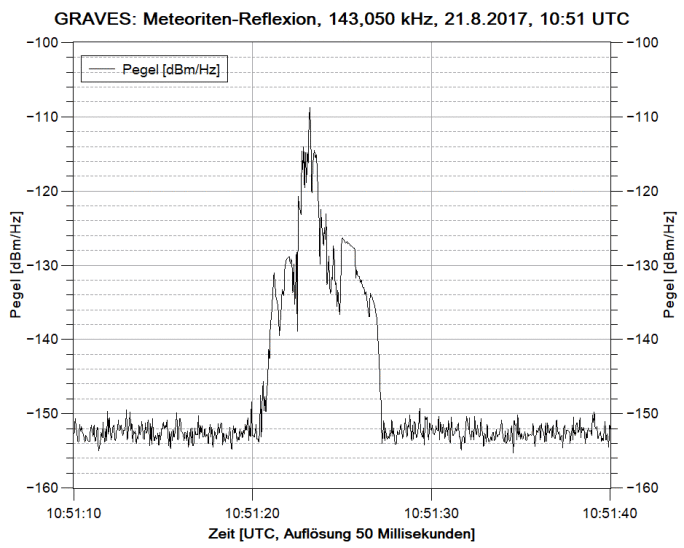 If you are in Europe you can also make use of the Graves radar simply by tuning to its frequency of 143.050 MHz and listening for reflections of its signal bouncing off things like meteors, planes and spacecraft. Since Graves points its signal upwards, it’s unlikely that you’ll directly receive the signal straight from the antenna, instead you’ll only see the reflections from objects. DK8OK also explains in his post how you can use SDR-Console V3 to create a level diagram which shows power vs time, allowing you to count reflections and visualize the response of the reflection. Any SDR that can tune to VHF frequencies such an an RTL-SDR can be used for monitoring reflections like this. If you aren’t in Europe you might consider looking for distant strong transmitters such as for TV/FM which you could also monitor for reflections. Graves reflection of a meteor trail visualized in SDR-Console V3.